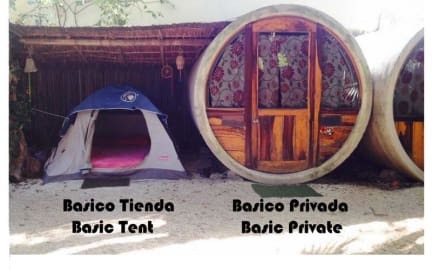 highly recommend this hostel when traveling to Tulum. perfect middle point between the beach and downtown, very secure, friendly and helpful employees, room was spotless upon move-in, and to our surprise each room (tube) has highly functioning AC! beautiful environment and definitely a great value for your money. The hostel has a great location in the middle of the way to the beach or to downtown. They rent bicycles so you can go both places easily. 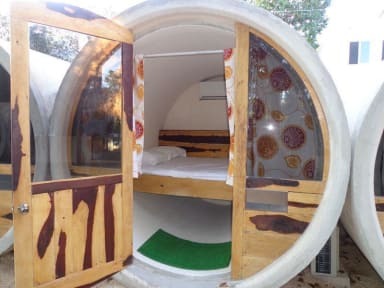 Room (tubes) are very small but clean and have air conditioner which is great. Restrooms and showers are clean. Overall atmosphere is calm, no bar. I recommend the place to travelers that want to be absolutely in calm, relax, and contact with nature. Would recommend this place!! The tubes were very cute and clean. The whole hostel had a very nice vibe with a rustic nature feel combined with the modernity of the design concept. Good location, good basic breakfast, and friendly staff. Cheap bike rentals were a plus. Only problem was that our door key didn't work at night so my boyfriend had to climb over the fence so we could get back in. Make sure to check the key beforehand! We stayed 2 nights in the tube rooms, they were super cool nice and clean with air con. Common areas were very quiet - no bar or pool. The location was in a quiet part of town but great for riding bikes to the beach and has nearby restaurants. Downside the WiFi wasn’t very good and lots of mosquitos! Overall was a good place to stay. My partner and I stayed at this hostel for one night. It was very cute, clean and quiet. The room itself was small and really just for sleeping (literally just a bed) but there were hammocks and a common space to hangout in. This place is ideal for couples or for travelers who want some privacy and a good nights sleep. There is complimentary breakfast from 730-10am but I recommend getting to the kitchen early as there were only crumbs left by 9am. We stayed in a tent for 1 night, and it was fine. The staff was great and helpfull. The pressure on the water in showers and kitchen were ridiculous, almost no water came out. Thet have cats here, and they jumped up on the table and tried to lick at your food again and again and again.